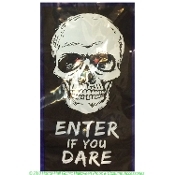 Spooky Light-Up --SKULL-ENTER IF YOU DARE-- Sheer Colorful Window Door Cover Wall Mural will give Halloween guests a scare as they approach your door. Scary gothic horror theme print LED bright flashing lights are displayed behind the eyes. Transform doors, windows or walls into a truly thrilling scene with this chilling light-up Halloween scene setter. It is sure to send a shudder down the spine of trick-or-treaters and guests alike with his spooky glowing lighted eyes. Hang door cover or wall mural with removable tape or sticky tack, not included. Suitable for exterior or interior of any standard size door. -Suitable for Door Cover, Window Hanging, Wall Mural, Shower Door Covering, Refrigerator Display, and more. 1. Pull plastic strip tab from battery light box for lights to turn on and begin flashing. *SAVE STRIP TAB TO REPLACE IN SLOT OF PLASTIC LIGHT BOX* after testing to save battery life. 2. Place battery light box into included clear plastic self-stick pocket. Remove adhesive strip covering and place pocket in the appropriate position on back of cover. 3. Hang door cover or wall mural with your own choice of removable tape or sticky tack, NOT included. ***ONE-TIME USE*** -Batteries are replaceable for extended use. *Not recommended for hot or extra warm sunny outdoor conditions to prevent damage to the plastic sheet. -Size: 30-inch (76.2cm) W x 60-inch (152.4cm) H.